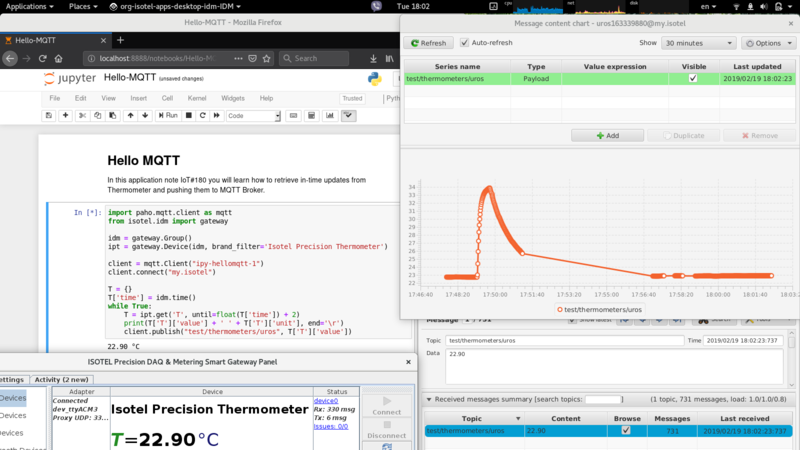 Here we represent small piece of python code which publishes the Thermometer readings to MQTT Broker. This example also shows a concept of post-processors, inserted between the IDM and the MQTT broker, which could in combination with other sensors do some more intelligent processing (as AI). In this example we have used USB-C to USB-A adapter to attach the thermometer to a PC. It runs on Linux, Windows and MAC OS. In this application note IoT#180 you will learn how to retrieve in-time updates from Thermometer and pushing them to MQTT Broker. Start the Mosquitto server or use one of the freely available ones, plug-in the thermomter, start the IDM, modify the client.connect() address of selected broker, topic under client.publish() , and simply run the cell. The samples will be pushed to the broker once per second, which may be observed and plotted by the mqtt-spy. In this simple example we only push the data, for which reason we do not setup any callbacks, neither we subscribe to any topic. T = ipt.get(‘T’, until=float(T[‘time’]) + 2) takes T[‘time’] as absolute UTC incremented for 2 seconds. In combination with the until parameter IDM waits and return the first next sample until given maximum time is reached. If sample is not received within the given time interval a request to fetch a sample is made. In the case of the thermometer, samples arrive at 1 second interval, so 2 seconds of margin is more than enough to receive the samples in as they arrive manner.